Dr Espen Gaarder Haug has more than 15 years of experience in Derivatives research and trading, and has worked for more than 20 years as a trader. Until recently he worked as a proprietary trader in J.P. Morgan New York, and as a derivatives trader for two multi-billion dollar hedge funds; Amaranth Investor and Paloma Partners, located in Greenwich Connecticut. Before that he worked for Tempus Financial Engineering, Chase Manhattan Bank (now J.P. Morgan Chase) and Den Norske Bank. He is the author of The Complete Guide of Option Pricing Formulas, which has become a reference manual among Wall Street professionals. He has a PhD from the Norwegian University of Science and Technology where he specialized in Option Valuation and Trading and has published extensively in practitioner and academic journals. He is currently considering setting up his own investment company - possibly the first Anti-Hedge fund! Nassim Taleb on Black Swans. Chapter 1 The Discovery of Fat-Tails in Price Data. Edward Thorp on Gambling and Trading. Chapter 2 Option Pricing and Hedging from Theory to Practice: Know Your Weapon III. 1 The Partly Ignored and Forgotten History. 2 Discrete Dynamic Delta Hedging under Geometric Brownian Motion. 3 Dynamic Delta Hedging Under Jump-Diffusion. 5 Portfolio Construction and Options Against Options. Alan Lewis on Stochastic Volatility and Jumps. Chapter 3 Back to Basics: A New Approach to the Discrete Dividend Problem Together with Jørgen Haug and Alan Lewis. Emanuel Derman the Wall Street Quant. Chapter 4 Closed Form Valuation of American Barrier Options. 1 Analytical Valuation of American Barrier Options. Peter Carr, The Wall Street Wizard of Option Symmetry and Volatility. Chapter 5 Valuation of Complex Barrier Options Using Barrier Symmetry. 1 Plain Vanilla Put–Call Symmetry. 3 Simple, Intuitive and Accurate Valuation of Double Barrier Options. 4 Static Hedging in the Real World. Chapter 6 Knock-in/out Margrabe with Jørgen Haug. Chapter 7 Resetting Strikes, Barriers and Time with Jørgen Haug. 2 Reset Strike Barrier Options. Bruno Dupire the Stochastic Wall Street Quant. Chapter 8 Asian Pyramid Power with Jørgen Haug and William Margrabe. 2 Calibrating to the Term Structure of Volatility. 3 From Geometric to Arithmetic. Eduardo Schwartz: the Yoga Master of Mathematical Finance. 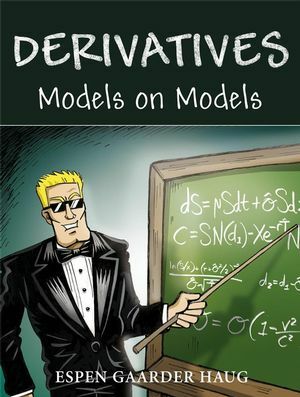 Chapter 9 Practical Valuation of Power Derivatives. Aaron Brown on Gambling, Poker and Trading. Chapter 10 A Look in the Antimatter Mirror. Knut Aase on Catastrophes and Financial Economics. Chapter 11 Negative Volatility and the Survival of the Western Financial Markets Knut K. Aase. 2 Negative Volatility – A Direct Approach. 3 The Value of a European Call Option for any Value – Positive or Negative – of the Volatility. 4 Negative Volatility – The Haug interpretation. 5 Chaotic Behavior from Deterministic Dynamics. Elie Ayache on Option Trading and Modeling. Chapter 12 Frozen Time Arbitrage. Haug on Wilmott and Wilmott on Wilmott. Chapter 13 Space-time Finance The Relativity Theory’s Implications for Mathematical Finance. 3 Advanced stage of Space-time Finance. 6 Black-Scholes in Special Relativity. 7 Relativity and Fat-Tailed Distributions. 8 General Relativity and Space-time Finance. 10 Traveling Back in Time Using Wormholes. Andrei Khrennikov on Negative Probabilities. Chapter 14 Why so Negative about Negative Probabilities? 1 The History of Negative Probability. 2 Negative Probabilities in Quantitative Finance. 3 Getting the Negative Probabilities to Really Work in Your Favor. 4 Hidden Variables in Finance. 5 The Future of Negative Probabilities in Quantitative Finance. 6 Appendix: Negative Probabilities in CRR Equivalent Trinomial Tree. David Bates on Crash and Jumps. Chapter 15 Hidden Conditions and Coin Flip Blow Up’s. 2 Coin Flip Blow Up’s. Peter J¨ackel on Monte Carlo Simulation.